Big news – massive gansta rapper Tauheed Eeps, otherwise known as 2 Chainz is on tour, hitting the Fox Theater Oakland on Monday 14th August!! Get ready for a night of hard-hitting rap and sick beats – hurry and hit the “Buy Tickets,” button! When tickets are gone, they’re really gone!! Initially gathering a fanbase as one half of the hip-hop duo Playaz Circle with Earl “Dolla Boy,” Conyers, he went on to sign with Def Jam Records as a solo act. The three singles from his first album, “Based on a T.R.U Story,” in 2013, “No Lie,” “I’m Different,” and “Birthday Song,” all hit the top 50 of the Billboard Hot 100!! The album was quickly certified Gold by the RIAA. 2 Chainz has since gone on to collaborate with massive names including Kanye West, Drake, Chance The Rapper and Lil Wayne. He has won multiple BET Hip Hop Awards, as well as the 2017 Grammy Award for Best Rap Performance, for the song “No Problem,” with Lil Wayne and Chance The Rapper. Now, 2 Chainz is on tour promoting his hotly anticipated upcoming album, “Pretty Girls Like Trap Music”! 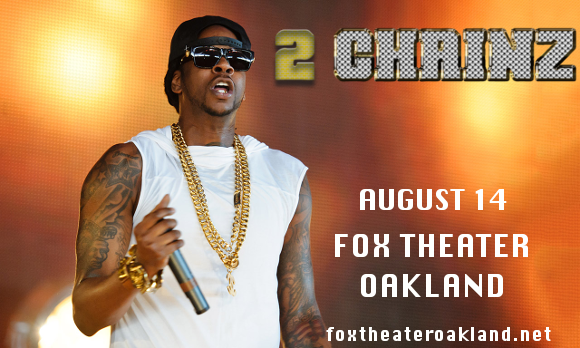 Be among the first to hear all the brand new material live – book your tickets to see 2 Chainz NOW while they last! !